Recently I've been spending a lot of time trying to get a new YouTube channel off the ground. I'd never really intended to start doing videos, but it just sort of happened, and now I'm just another victim of the machine: A disembodied voice in the vast expanse of the Internet, wailing, "Look at me!" If I'm honest, I'm not good with cameras. I don't like having my picture taken, I don't like being the centre of attention, and even just recording my voice fills me with anxiety. I've always been more comfortable writing. It's no wonder I became a novelist; even less of a wonder I became a freelance content provider so I could lock myself away at home and project myself onto the world from the comparative safety of my computer. Words are my safe place. They let me express myself in a way I'm far too awkward to do in real life. But I don't hide behind my words. My words are the only way I have to show the real me. And yet, recently I've been producing more videos than written content; because that's the way the world is turning. I don't like it, but I feel it in my bones... a definite shift in the audience. People don't want to fire up their computers to read. Video killed the written review. So, like a monster rising from its slab, we lurch stiltedly to the point of this special Halloween review: The future of the written word scares me. Research conducted in 2012 revealed that one in five children in England cannot read well by age 11; and only 26 percent of 10-year-olds like reading. I fell in love with reading before I could talk. I devoured books in my spare time, and wrote my first novel when I was 16. I read anything, but fantasy and horror books were always my passion. I loved to vanish into worlds populated by myths and monsters; and the Fear Street books by R. L. Stine were always on my reading list. His spooky tales for teens weren't particularly deep or inventive, but they were all kinds of fun. In the 1990s, he started writing the Goosebumps horror books for younger children. By that time, I was in my early teens and already reading the works of Stephen King and James Herbert (I was a weird kid), but I loved the idea of a series of horrible books for kids intended to give them a fright. It's an idea that has followed me throughout my life, and every book I write is informed by that idea of giving kids chills along with the thrills. And so, in celebration of Halloween, one of my favourite days of the year, I thought I would celebrate the work of R. L. Stine by reviewing Goosebumps: Terror in the Graveyard. It's also a game with a gimmick, and anyone who's visited my blog before knows that I'm a big fan of games with mechanical components, voice boxes, or weird stuff crowbared in to encourage kids away from their video games for a while. In this particular case, the gimmick is a board with constantly shifting spaces, and a ghost on a spring. So, this is one of those old games where the instructions for assembling the board are actually longer than the instructions for playing. 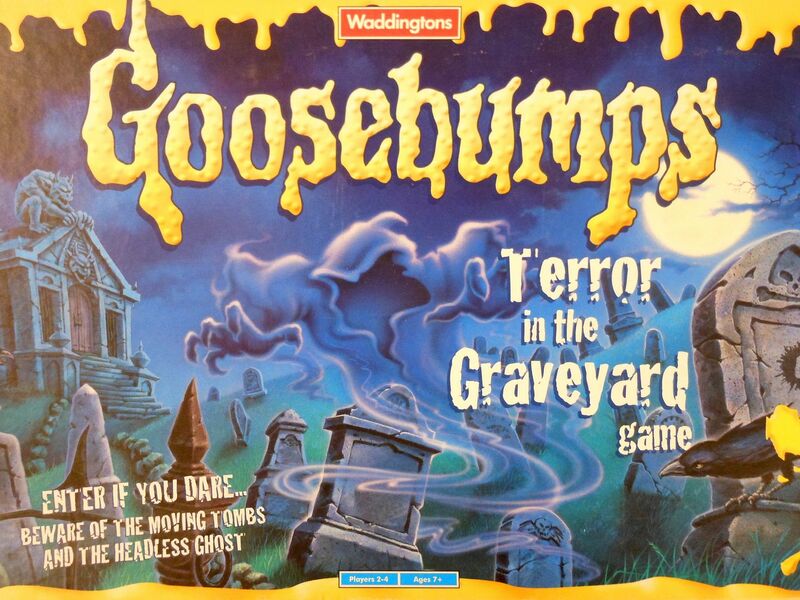 There are three sliding panels with various pictures printed on them, and they sit underneath the gameboard, which depicts the titular graveyard. 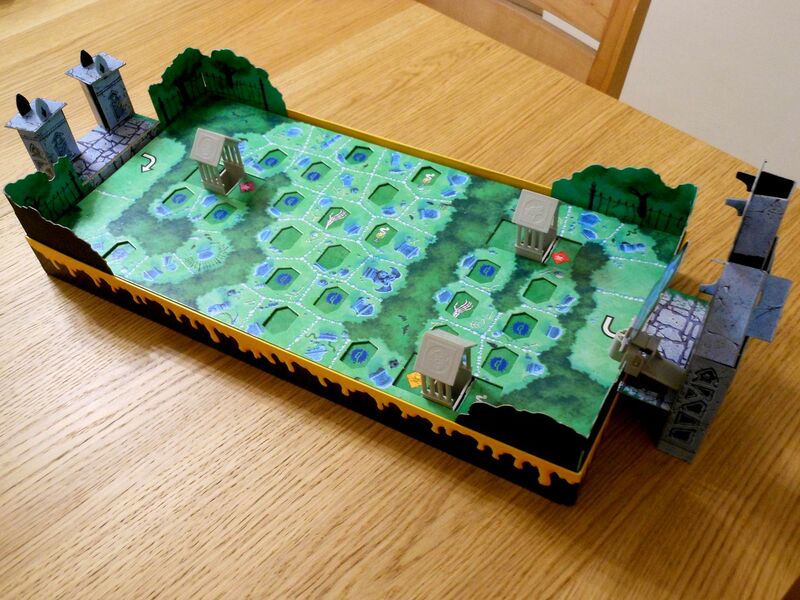 There are holes in the game board that allows the pictures on the panels underneath to show through, and during the game you slide the panels up and down to make the pictures change. Kinda like those moving eye faces you used to make with empty matchboxes when you were a kid. Everybody used to make those, right? 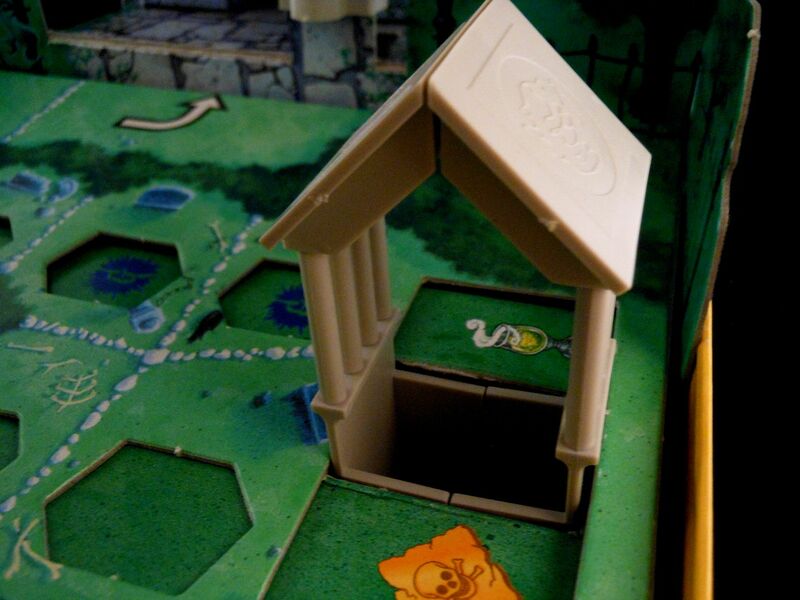 Anyway, the panels slide by pulling on one of three plastic tombs, which double as pit traps during the game. 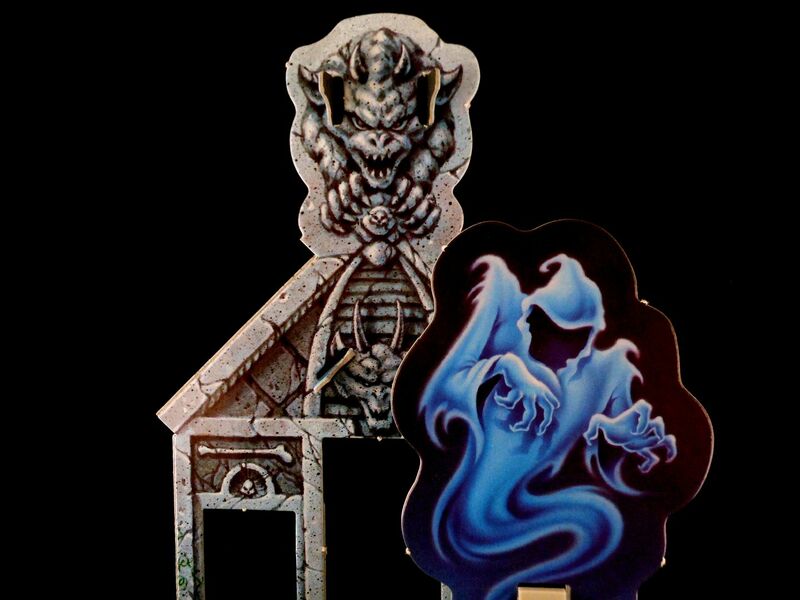 There's also a cool but completely cosmetic gate at the start zone, a cute hedge running around the board (also cosmetic), and a tomb at the far side housing the horrifying spook on a spring. This springy spectre is the Headless Ghost, although he's actually more of a Faceless Ghost if you wanted to be pedantic. Apparently, he's trapped various characters from the Goosebumps stories in the graveyard, and now they need to find a magic ring (because there's always magic jewellery) to banish the ghost and escape. Of course, in true horror movie style, nobody's going to think logically and work together; so everybody is out for themselves, and they're more than willing to throw everybody else under the bus (or tombstone) to save their own necks. 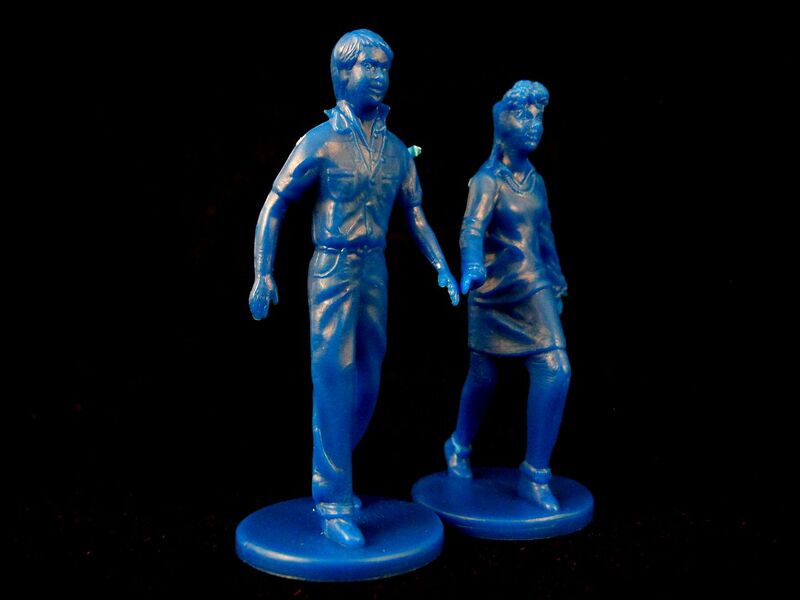 Each player takes control of two pawns of the same colour (a boy and a girl), places them on the starting zone, and the game's a(disembodied, decomposing)foot. Turns move quickly, and there's no surprise to find this is a roll and move game. Only there's a (Transylvania) twist. You roll two custom dice. 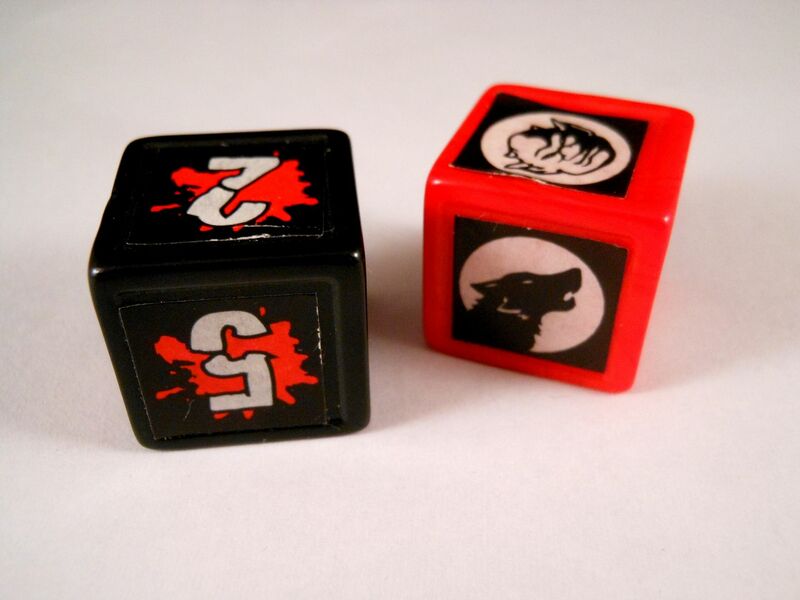 One has symbols that match symbols printed on the three plastic tombs on the gameboard, and the other is a number dice. After rolling, you move the tomb matching your roll, and then you move one of your two pawns. It's that simple. 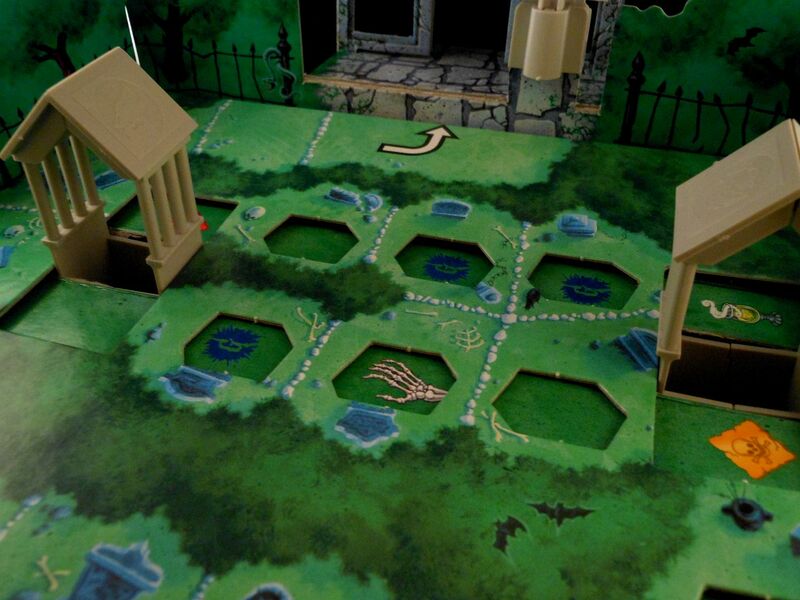 But the fun, of course, comes from how moving the tombs changes the spaces on the board. 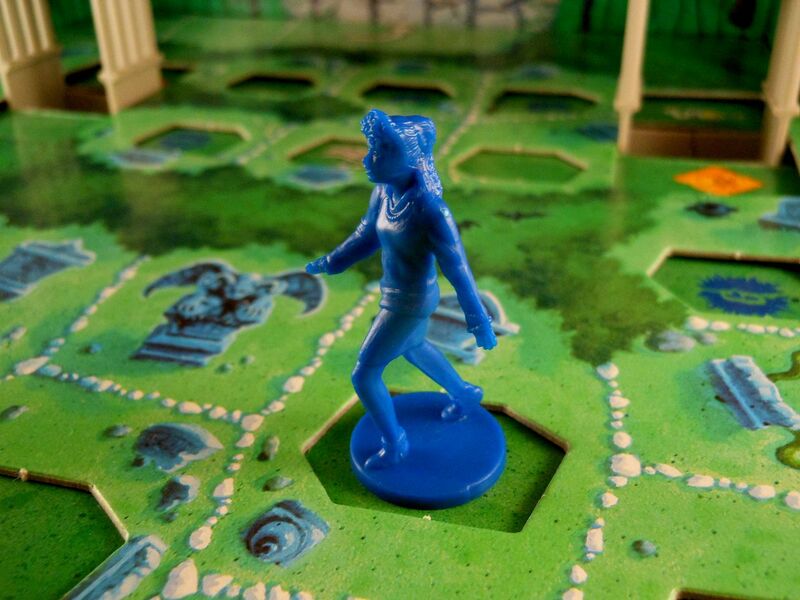 After moving a tomb, all players must check to see if their pawns are now standing on symbols that need to be resolved (some symbols only activate if you land on them when moving by dice roll). Additionally, if a pawn falls into the tomb pit, that pawn is permanently out of the game. 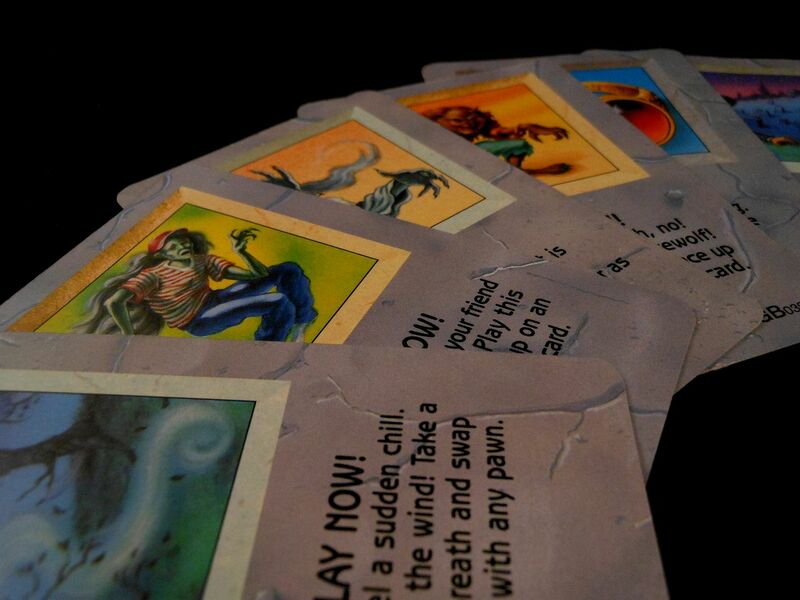 Common space actions include being paralysed by a skeletal hand, advancing forwards, or drawing one of the special Goosebumps cards. Drawing cards is how you find the magic ring you need, and there are several in the deck, because why wouldn't a ghost hang out in the graveyard where someone has carelessly discarded multiple versions of the magical trinket capable of destroying him? Some cards also give you the opportunity to turn your "friends" into monsters. I have to admit, it's quite amusing to suddenly turn into a werewolf, or to discover you're actually a ghost that's been haunting the cemetery all along. Of course, the in-game rules don't really make as much use of this concept as they should. While you're a monster, you can't win the game or draw cards: You just have to wander around until you land on a magic potion that cures you. Eventually, somebody reaches the Headless / Faceless / Brainless Ghost with a ring. 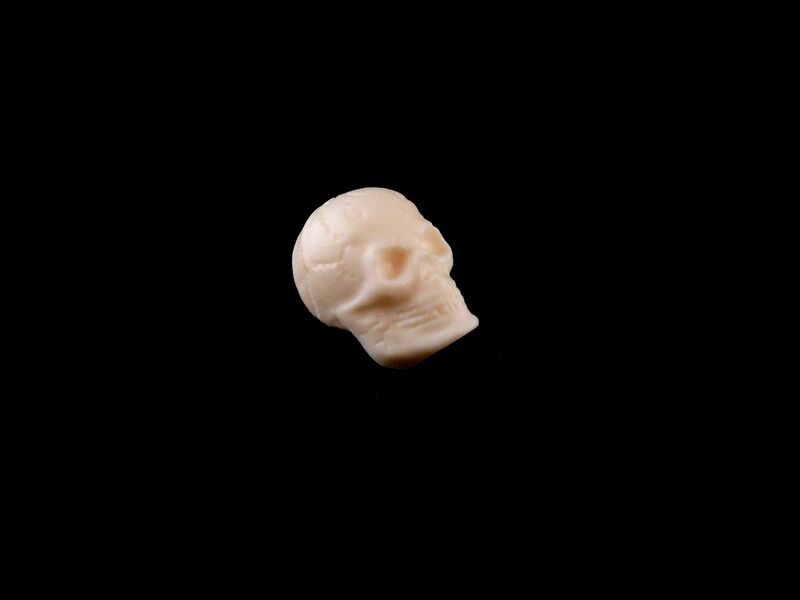 When that happens you drop a little plastic skull into the ghost's tomb. It rattles down a chute, and either lands on an empty spot (in which case the game continues) or lands on a lever that fires the ghost up into the air and signifies the end of the game. And yes... if you think that sounds a little bit like the mechanism from Ghost Castle (or Which Witch? if you're not from around these here parts), that's because it is a little bit like that mechanism. And that's your lot really. It's a pretty simple roll and move game, incorporating some "that that" elements with the card play, a pretty cool shifting paths mechanism, and some silly gimmicks to raise a few smiles as you raise the dead. Probably better than okay (especially when you look at it through the eyes of a child rather than through the eyes of a jaded middle-aged man). To be honest, "okay" is the least I would have expected from designer Craig Van Ness. Yes: That Craig Van Ness; the man behind Heroscape, Magic the Gathering: Arena of the Planeswalkers, Iron Man Battling Card Game, Star Wars: The Queen's Gambit, and Star Wars: Epic Duels (to name just a few). 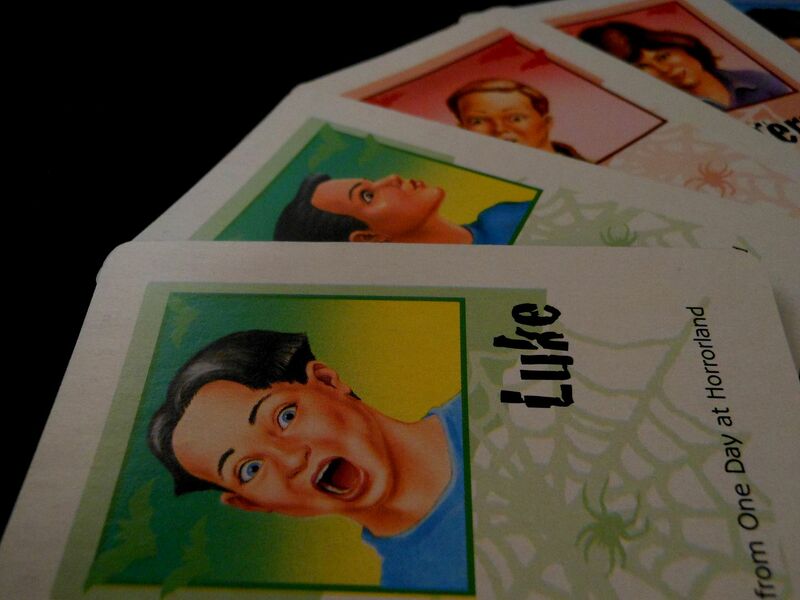 This is a designer who really knows how to make fun games. He's also a designer who really knows how to make games for a specific market. Goosebumps: Terror in the Graveyard pitches at the people who read the books, or should read the books. And it balances everything perfectly for that market. For example, the gameplay involves just enough reading to improve literacy without the words becoming a barrier to entry or slowing down gameplay; and the "take that" elements are exactly the sort of mechanisms that kids love because it gives them a chance to pick on mum and dad, and ensures there's always a chance for a last minute comeback when they're losing. Best of all, the roll and move gameplay is luck-driven, but the board doesn't feature a linear path, so you have much more freedom of movement. Additionally, when it's time to move a tomb pit you sometimes have a choice of which direction to move it, so it's possible to shift the board in your favour. This creates decision points that aren't going to induce analysis-paralysis in younger children, while most of the game still leans heavily on luck so players of different ages can compete on a level footing. There are, however, a few rules that don't sit well with me. In fact, the game includes two of my least favourite game mechanisms: Player elimination and missing a turn. kids don't get to actually take part. I dislike "miss a go" mechanisms for the same reason, and in Terror in the Graveyard this rule is particularly egregious because you could miss several turns in a row. If you land on a skeletal hand, you aren't allowed to move that pawn again until the hand goes away; and that's only going to happen when someone moves the tomb connected to that particular part of the board. Again, having two pawns mitigates this problem a bit; but if one of your pawns falls down a pit, and the other lands on a skeletal hand, you're going to have a rubbish time. In the balance, I would say the game does more right than it does wrong. It's about what you would expect from a kid's game. From an adult's perspective it's playable. Sometimes even enjoyable. From a kid's perspective, it's something a bit more special. It's a living world of spooky fun. It's also an advertisement to read. 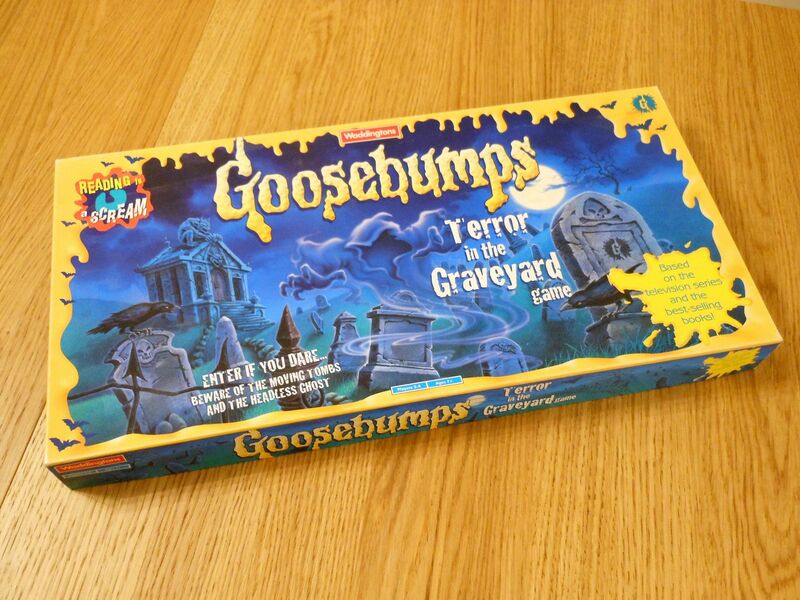 From the references to popular characters on the cards, to the "Reading is a scream" slogan on the box art, this game never lets you forget that when you've packed the game away, you still have a whole world of R. L. Stine's monstrous brand of mayhem to explore. And as far as I'm concerned, any game that promotes reading is a good game. After all, is there anything more terrifying than the vision of a future in which children don't read anymore? What would they do instead? Watch YouTube videos?